The ASOR’s Cultural Heritage Initiatives September 2017 Monthly Report is now available here. Reported SARG-Russian airstrikes damaged Ebla, Idlib Governorate. ASOR CHI Incident Report SHI 17-0167. New photographs show damage to the Raqqa Museum as well as historical sites in Raqqa Governorate, including Heraqla, Qasr al-Banat, al-Rafiqah Wall, and Bab Baghdad. ASOR CHI Incident Report SHI 17-0098 UPDATE, SHI 17-0106 UPDATE, SHI 17-0111 UPDATE, SHI 17-0122 UPDATE, and SHI 17-0127 UPDATE. 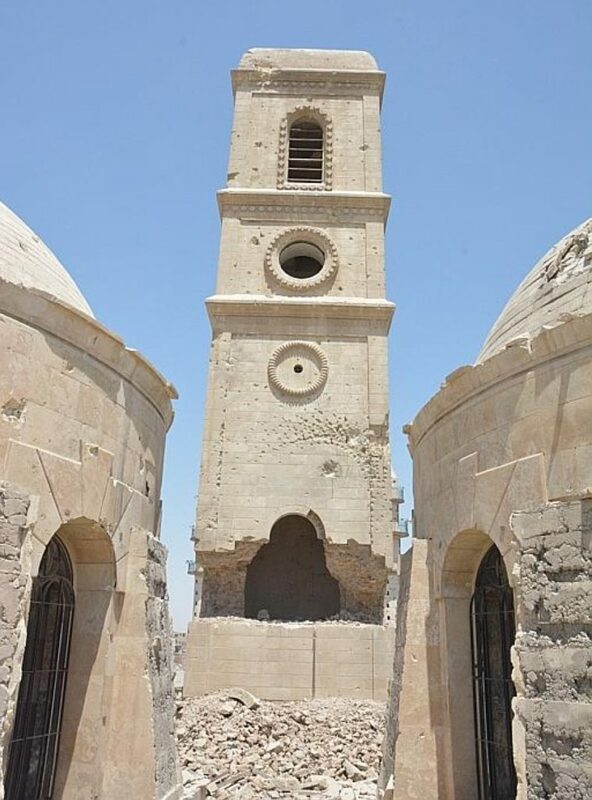 New video footage shows damage to al-Nour Mosque in Tal Afar, Ninawa Governorate. ASOR CHI Incident Report IHI 17-0074. Five historic buildings were illegally torn down and replaced by a new construction in the old city of Tripoli, Tripolitania. ASOR CHI Incident Report LHI 17-0023, LHI 17-0024, LHI 17-0025, LHI 17-0026, and LHI 17-0027. The Bosra Sham Antiquities Department have shared a video by the Orient express showing the damage levels in Bosra. It can be viewed here. The Syrian Directorate General of Antiquities and Museums report on fire at a registered property in Damascus here and here, and the collapse of an old house in Damascus. It can be viewed here. The Facebook Page Aleppo Archaeology has shared a number of photos of damage to Aleppo’s Old City, which can be viewed here. “In a secret hideout in eastern Homs, the Syrian Arab Army (SAA) has discovered a large amount of artifacts that were removed from Palmyra Museum as ISIS overran the city back in 2015.” Watch the video on the Al Masdar News website here. To stay connected with their homeland, Syrian migrants living in Egypt perform traditional songs and odes. Read the full Al-Monitor article here. As part of Culture Day, Al-Assad National Library exhibited several manuscripts documenting Syria’s cultural heritage. Learn more and view photos on the SANA website here. The Idlib Antiquities Centre is working to document the status of damage to Syria’s dead cities. See the photos of the work here. The Authority of Tourism and Protection of Antiquities has also been working to document sites in Haseke -Ajaja and Tawabir . Read more on their work here. As part of a project to revive Aleppo’s old souqs, a 4-day festival in Khan al-Jumrok celebrated cultural, artistic, historical and archaeological activities. Read more on the SANA website here. A week-long Ministry of Culture event celebrates Syrian culture in fields such as cinema, music, theater, concerts and antiquities, and will include exhibitions about recent archaeological finds. November 23 – 30, Damascus. Read more on the Sana website here. The Syrian DGAM have signed an MoU with the Prague Museum, which aims at providing the necessary materials and expertise to the General Directorate. Read more on the agreement here. The Museum in turn is to host a major exhibition to inform the Czech public about Syria’s heritage, here. ICCROM and UNESCO’s handbook to save heritage collections in emergencies now available for free download for Arabic readers here. Russia, Turkey, and Iran have adopted a joint declaration on Syria and urged the international community to provide humanitarian assistance to Syria for preservation of historic heritage. Read more here. Faced with barring a young Syrian architect from their next General Assembly or returning a grant for the event, ICOMOS are standing by their principles and returning the grant. They are asking for help to raise the €80,000! Donate and learn more online here. The Director General of the Czech National Museum has earmarked $1.8 million for supporting the archaeological sector in Syria until 2019. “The damaged 2,000-year-old Lion of Al-Lāt statue is now restored! Great work from Directorate-General of Antiquities & Museums, DGAM Syria European+Union and UNESCO.” Watch the video on Facebook here. The Italian “Incontro di Civilta” Association is organizing a Palmyra exhibition for ICCROM’s General Assembly, 29 November – 1 December 2017. Read more on the SANA website here. A recent workshop in Vicenza, Italy, focused on combating the illicit cross-border trafficking of cultural property. Read more on the OSCE website here. The UNHCR wrote about the Orpheus XXI Orchestra, which includes traditional music directed by Syrian flautist Moslem Rahal here. The Malay Mail Online wrote about restoration in Aleppo’s Old City and the return of traders to the famous souk here. The Aleppo Project published an article about how Aleppo — “once the main economic, political and administrative hub” of Northern Syria — may be eclipsed by Damascus. Read it here. Al Monitor reported on a website called “The Creative Memory of the Syrian Revolution,” which documents the creative side of Syrian revolution here. The My Central Jersey website wrote about Rutgers Professor Salam Al Kuntar, who has spent the past six years fighting to preserve Syria’s ancient cultural heritage. Read more here. The Washington Report on Middle Eastern Affairs wrote about a recent program by the Turkish Heritage Organization and the George Washington University chapter of No Lost Generation, which co-presented a Nov. 16 program titled “Education for Displaced Syrians: Innovative Solutions to a Complex Challenge.” See it here. News Deeply published a list of ten experts to watch on reconstruction in Syria, including The Aleppo Project’s AlHakam Shaar. See more information here.